Continuing to catch up on the fine artists I found while attending the great Gold Coast Art Fair in Chicago this past June – today, I feature the fine folks from Great Lake Art. 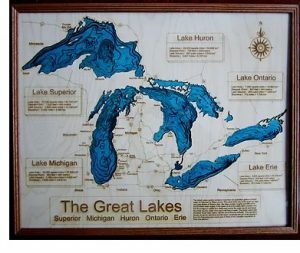 Great Lake Art produces a series of artwork featuring 3D reliefs of lakes (and other things) from all over the country. Learn more about Great Lake Art and see all their fine works here. Lost Cowboy is powered by	WordPress 5.0.4 and delivered to you in 0.796 seconds using 40 queries.